Marsquakes. No, it’s not the title of an absolutely awful (but completely awesome) Syfy original movie. We’re just talking about ordinary earthquakes, but on Mars. 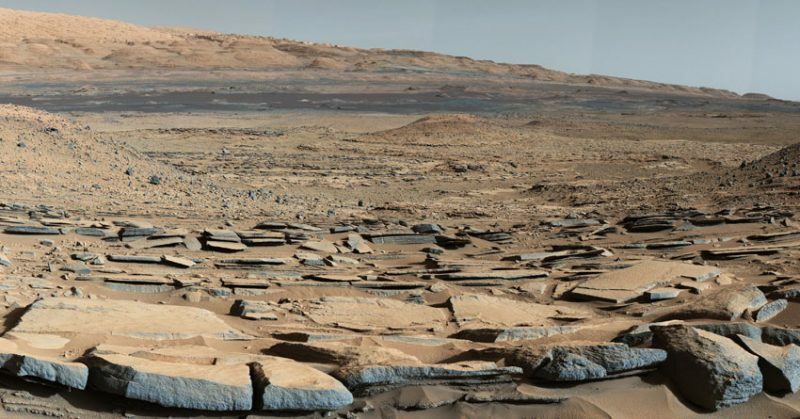 These ordinary geological events just became a lot more exciting, however, because scientists believe marsquakes contribute to creating a habitable environment for alien life on Mars. Chemical reactions create energy necessary for life (as we know it). Rock fracturing that occurs during earthquakes can produce hydrogen gas resulting from silicon reacting with water. Some scientists speculate that hydrogen and oxygen gas reactions provided the energy for Earth’s earliest life. So a team of researchers wanted to see if marsquakes are capable of generating enough hydrogen gas to support life. Yale University geomicrobiologist Sean McMahon led the research team as they examined the type of rocks that result from earthquake grinding. The team was pleasantly surprised to discover that these rocks along active fault lines contained hundreds of times more hydrogen than surrounding rocks. This volume of hydrogen is enough to sustain hydrogenotrophs–bacteria that survive deep underground on Earth. “Our findings are a contribution to a broader picture of how geological processes can support microbial life in extreme environments,” McMahon explains. When it comes to whether marsquakes and water might work together to generate hydrogen on Mars, previous research suggested that liquid water was once abundant on the surface of Mars. It also suggests that large reserves of liquid water may still exist underground on the Red Planet at depths of about 3 miles (5 kilometers) on average. However, Mars has much fewer quakes than Earth, because the Red Planet nowadays lacks both volcanism and plate tectonics. Although marsquakes occur less frequently than earthquakes, the researchers believe the quakes are capable of producing enough hydrogen to power sporadic pockets of alien life on Mars. The team looks forward to getting their hands on actual marsquake data. And, fortunately, they shouldn’t have to wait too long. NASA’s 2018 InSight mission will specifically study seismic activity on Mars. McMahon and his team’s research was published in the journal Astrobiology.